As of Wednesday, smelly water appeared to be spreading into portions of East and Northeast Austin. AUSTIN, Texas — If you thought you were spared from the smelly water that's been plaguing parts of Austin, it could still be heading your way. It's on the move throughout the city's system. Originally, most of the complaints about the bad-smelling water came from neighborhoods located generally south of Lady Bird Lake and Central Austin. RELATED: Zebra mussels | Where did they come from and why are they an issue? RELATED: Is there a solution to the zebra mussel problem in Central Texas? But as of Wednesday, smelly water appeared to be spreading into portions of East and Northeast Austin. Viewers told KVUE they saw the city opening fire hydrants in Northeast Austin on Wednesday. One person said the smell was awful. The trouble started late last week in the water pumped by the Ulrich Water Treatment Plant on the west side of Austin. Intake pipes from Lake Austin had become contaminated by dead zebra mussels. Now, Austin Water said since that same plant supplies some of the water to East and Northeast Austin, that bad-smelling, bad-tasting water is moving and could begin affecting those areas until the system is completely flushed. This week, there have been nearly 2,500 complaints, most of them coming from the 78748, 78749 and 78745 zip codes. 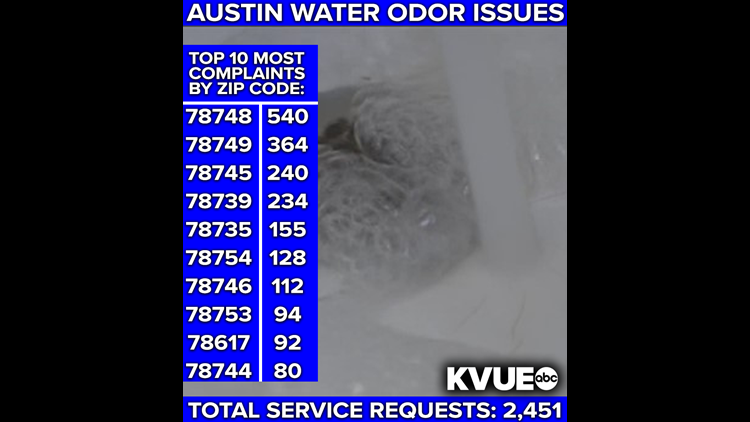 But, Austin Water believes many more people are affected than what is represented in the number of phone calls.